Welcome to the Meeting House Grand Ballroom, a family operation. Tracy and Todd first met where the family business first started, at the original Mayflower Hotel in downtown Plymouth. Tracy worked in the Mayflower Dining Room, Steak House and Crow’s Nest serving fine cuisine to all the Plymouth locals. Todd worked behind the scene as a chef in the many kitchens there creating unique dishes, dinner specials, and amazing Sunday brunches. As the era of the beloved Mayflower Hotel came to an end, Tracy and Todd left for new ventures. Tracy found herself in the mortgage business and Todd went to Ann Arbor to helm a busy hotel kitchen. Twenty years later, they found themselves back where they first met and learning the wedding profession from their aunt and uncle, Mary and Randy. With the exceptional knowledge of food, excellent service, and an eye for details, Tracy and Todd have carried the tradition into the third generation. We welcome you to our beautiful ballroom! Ralph and Mabel Lorenz ( Randy’s parents & Todd’s grandparents) purchase the Mayflower Meeting House. 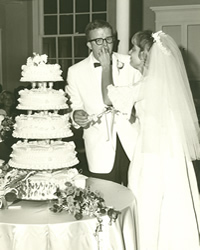 August 7th, the first wedding reception is held at the Meeting House uniting Randy’s sister Sheila Lorenz and Fred Osann. Todd was born to the happy couple five years later. 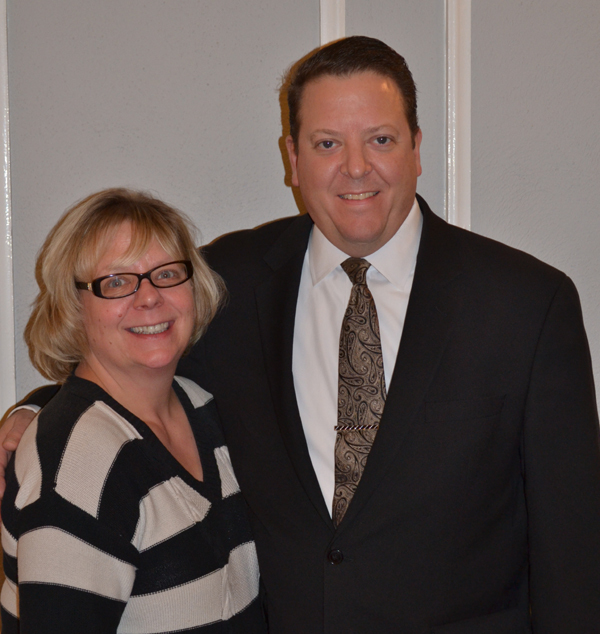 Todd and Tracy meet while working at the Mayflower Hotel / Meeting House Grand Ballroom. They tied the knot in 1996. Mary and Randy form Exclusive Catering Inc. and devote all their attentions to operating the Meeting House Grand Ballroom primarily as a wedding reception venue. Todd, Tracy, Mary, and Randy celebrate 20 years of service to over 1,000 brides and grooms. We introduce you to the creator of all of our fine food, Chef Linda. Linda comes to us from Washtenaw Community College’s School of Culinary Arts. She has been the executive chef at the Meeting House Grand Ballroom for more than 24 years! Linda has created every menu item we have available for your event. Exceptional meals, spectacular homemade appetizers, and delicious salads are prepared in house by Linda and her trained kitchen staff. Chef Linda can create a meal to satisfy even the most discerning guests as well as prepare specialized meals for those with dietary restrictions. Meal portions are generous and expertly presented. Your guests will rave about the excellent meal they had here, Bon Appetit!